For the 2010 season a new Gaastra Formula board will be introduced. The board is the same as the 2008/9 board, only the construction is different. The board was part of a weight loss challenge, and it lost about 500 grams. So for the 2010 season Gaastra will have 2 FW boards: the Vapor Formula and the Vapor Formula Pro. And another session. Temperature was about 10 degrees celsius. Wind approx 12-15 knots. I rigged the 8.4m2 Vapor, Tabou Manta79 and a Select Viper 45 fin. It has been a long time since I surfed all alone. But, it's Monday, it's December so nobody there who skipped work, only me. But it's my weekend, since I start the nightshift this week. Maybe, if I am awake early (which I don't hope to be honest) tomorrow, I'm going for another short session. Just to keep my body going. But first, I have to make those 8 hours @ work untill 0700 hours, going to bed and then let's wait and see. Finally I was on the water again, after almost 7 weeks no surf. I was doing some things at home, and yesterday almost everything was done. The water is pretty cold now, my feet were killing me. I could not find my winterboots today, so used my summershoes. I used the Manta54 + 6.7 Vapor and 29cm fin. It went pretty good. Tomorrow another session, 14 knots is predicted. And again my search to a lowwind Formula Fin continues. This year I bought the Hurricane FRB8 Soft. After using it quit a lot, I found out that this fin is great with a little bit of wind, let's say 10 knots minimal. 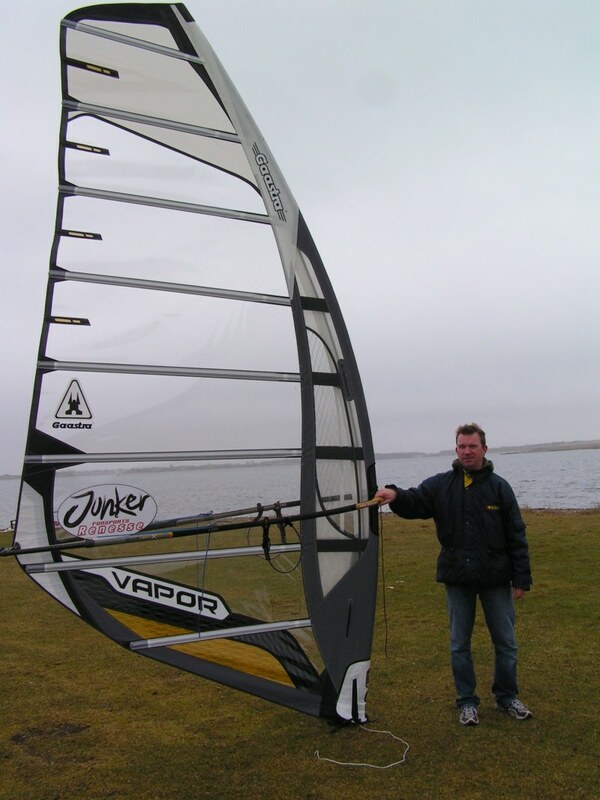 I used it with the Belgian Champignonship where windspeeds went up to 17 knots. The FRB8 is performing very good with the 11.0m2 in those winds. When windspeed is dropping under the 10 knots, I have difficulties with the 12.0m2 to get the board railing. Of course my technics still have plenty of room for improvement, but also the fin needs an upgrade. They told me regarding the CR, the outline is similar to the Kashy. But the F4 fin has less drag then the Kashy, and the Kashy has a bit more lift for the same size. So you have to size the F4 up with 1-2 cm to get the same amount of power as a kashy. Things are sounding very nice. An other option I have is the new Hurricane Fin, the FRB10. This is not a cutdown version, but has a normal tip. And another version is a VMG fin. Also someone from Holland is making fins right now, based on the Kashy design. These fins are allready tested and it all sounds very good. I have the possibility the test them also, so I think I wait for these testresults before ordering any other VMG, F4, Hurricane fin. So, still busy with material, but that's just fun! Last week I had 3 good sessions. 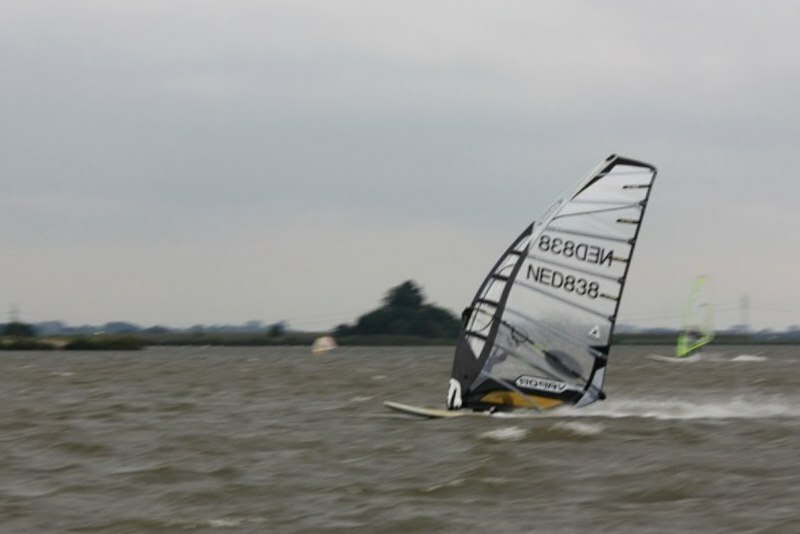 During the last session I have tried a new fin I got from Martin van Meurs : C3 Venom 34 cm. I used it with the Tabou Manta64 and Vapor 6.7m2. The wind was not really strong, but I still had a good session. Max speed was 66.5km/hr and best run 65.0 km/hr. 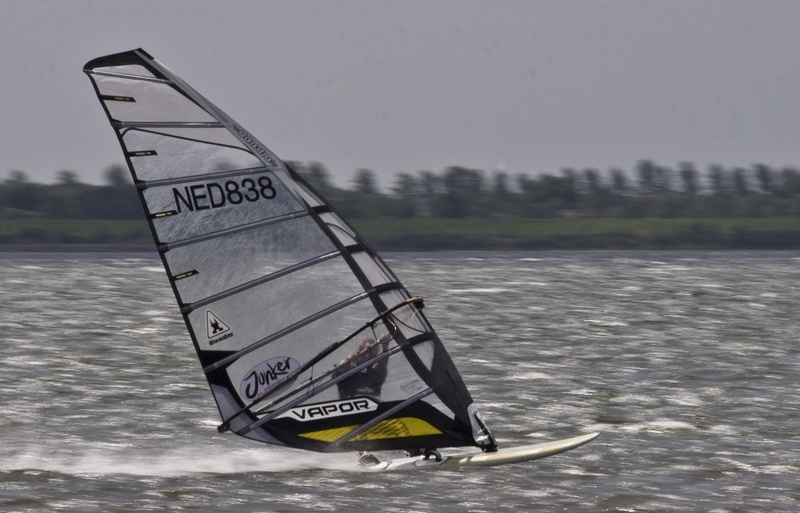 The fin gives a lot of controll downwind. I try to get my hands on some more C3 Venoms! I also am changing my style a bit. Martin gave some tips, and they seem to work just fine. Hopefully this week some time and wind! I have had 47 sessions this year untill now, not really much. Last Friday I went to Bad Hoophuizen, which is a 2 hour drive to compete with the Fun Speed Meeting that was going on, Saturday. 100 competitors were there. Amazing to see so many people on a meeting. It was very nice to do a 500 metres course. At 3/4 the wind was dropping on the course, so it was difficult to keep the board going, and to keep pressure in the sail. But overall I am very happy with the results. We have to wait for the finall result but till now 46 GPS-ses are implemented in the 500 metres course and I am 8th right now. 13th in the first heat and 5th in the second leg. In the evening we had a great buffet and afterwards we looked the 2000 pictures that were taken. I was sitting next to Martin van Meurs and he gave me some tips. Next day I borrowed a fin from him and I tried to use the tips he gave. And I think this is going to help me to go a lot faster. But it's difficult to change your technik. The fin felt good (C3 venom) for flat water. 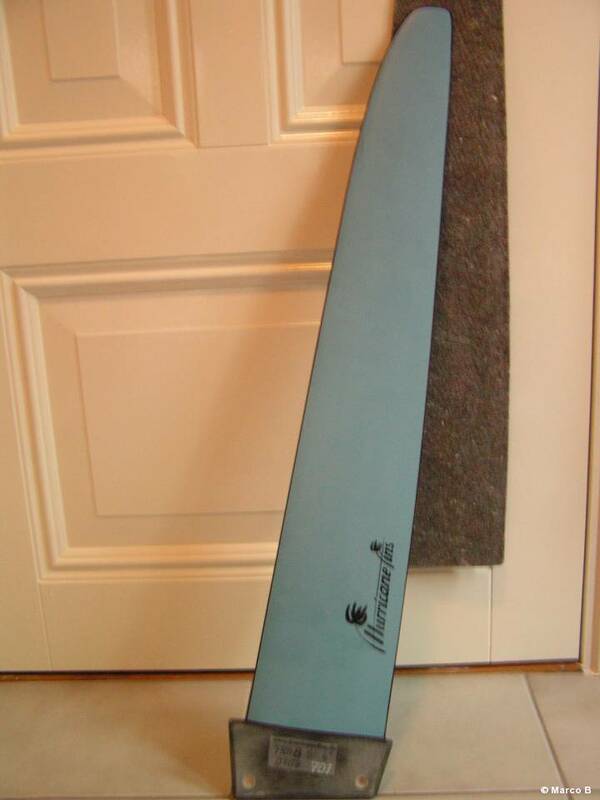 I am wondering how these fins will perform under the Manta boards on my home speedspot Herkingen! Organisation, thanks for this great meeting! Since I can analyze the visitors of my website, I see that a lot are coming out of Holland, but still a lot also from Holland. I was thinking, to change the weblog back to Dutch. I think I can express myself better in Dutch and it is easier to type. But I want to ask you guys, what shall I do? Keep it in English, or change it into Dutch for the next year? I saw Arnon Dagnan was using quit an experimental proto sail during the World Cup Formula sailing in Spain this week in Santa Pola. Not a totally new idea, but I am wondering why he is testing this one. Are we going to see this back in 2010? I wonder how someone could use the variabel outhaul with such a construction. Last Friday I went to the doctor. I had a thickening on my back, caused by an infection. The tickening was quit big. Sunday I tried to do some surf, but I felt it in my harness. Monday I had to go to the hospital. I wont tell you the details, but a lot of dirt came out of the "thing". The surgery was quit painfull. I had an extra anaesthetic but I felt a lot from the cutting. The source of all problems was an infected sebaceous gland (I had to look that up in the dictionary) = talgklier. The wound has not been fixed but is still open so the dirt can go out. Strange feeling to have an hole in your back I must say. Now I have some time to sort out some pictures and put them on my website of the past years. Here are some extra shots of the 2010 Vapor. Last 7 days, I could do a surfsession each day. And that without having vacation, even working the nightshift. Now I take a break (1 day). I am eating Macaroni for 3 days now, but the energy is getting less. Thursday it is windy again, so I keep my energy for that day! Last weekend I went to spot "de punt" for the BK. 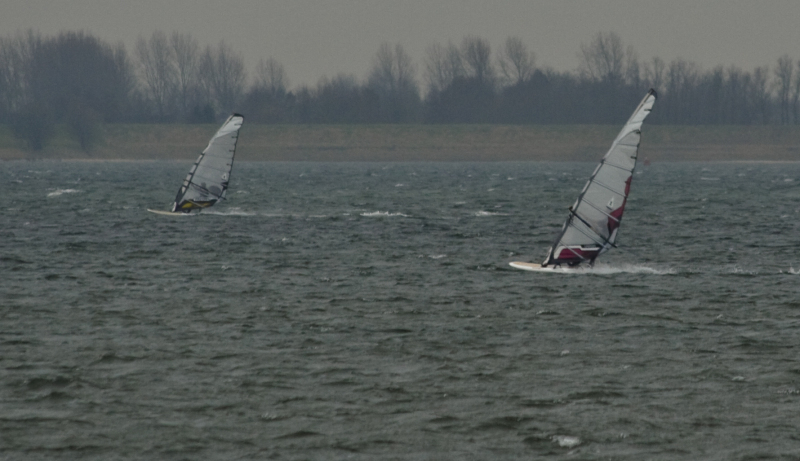 On Saturday there was enough wind to do some slalom. The water was really flat, and the wind was approx. 17-18 knots. Perfect for the Manta79 + 7.6m2. 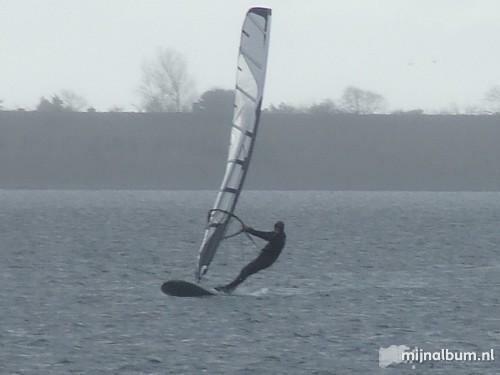 In the morning the wind was a bit more, and I allready tuned up the Manta64 + Vapor 7.6m2. 10 minutes before the first start I decided to take the Manta79 instead and that was a good decision. The group (42 in totall) was split in 4 smaller groups : 1, 2, 3, 4. First race group 1 + 2 where on the water, second race group 3 + 4. The first 10 of each race went to the winners final, the second 10 to the losers finall. In the first race I became 10th, and I went to the winners. In the winners finall I made 2 mistakes during gybing, and I ended up last. The second race again some gybes went wrong, and I ended up in the losers. My speed was good. After gybing the mark, I could take some places back by going faster than the guys in front of me. Sunday we did 5 Formula races. The wind was strong with 16 knots, so I took the 11.0 Vapor. My starts went great. I was on the 6th place most of the time, going over the startline. There were about 21 racers, and after 5 races I was on 15th place. I've got a good feeling about this weekend, and now I know what I have to improve. This is how the FW-course looked like. Start between the startboot and pin-end. Then upwind, tack and round boei 1. Going to boei 2, round that one. Going downwind, gybe and round boei 3. Going upwind again, tack, and round boei 1. After that round boei 2 ... downwind, gybe and finish between boei 3 and startboot. Here is allready some information about the 2010 Tabou Manta. Info you allready can find on the web, so I guess Tabou won't make a problem of it that I post it here. 2 new sizes will be add to the series. The Manta65 (that will replace the Manta64) and the Manta75. The 65 has 100 litres, the 75 has 115 litres. Also there is going to be another update regarding the Manta59. The new Manta59II will have a similair shape as the Manta54. My plan is to keep all the boards I have now (54/64/79/Formula), and not to buy any more. I don't wanna change material so fast anymore. I am even thinking about keeping all the 2009 Vapor sails next year so I have got plenty off time to tune up all my sails until I can do it in the blind. It has been a while I did some Formula surfing with stronger winds and flat water. I think I did'nt had a try with the Vapor board. I put the same fin under the board, as I used with my previous board while doing my best speed on Formula ever. (Deboichet R13 68cm Medium). But the set did'nt performed well. The board sticked too much on the water and I had trouble to keep it flying. It's very difficult with the fin : or the board sticks, or the board has a tailwalk. Maybe the fin is too stiff for the board. But, next time I will try again. Maybe I need a whole day to sort things out. Now I only had 1 hour TOW. Yesterday went to the Brouwersdam. A big dam that is built between the North Sea and Lake Grevelingen. It was Sunday so there were a lot of tourists over there. Also the temperatures were very good with approx 26 degrees celsius. I took the 11.0 m2 for a ride. I almost did'nt used this sail this season, so it was about time for some TOW. 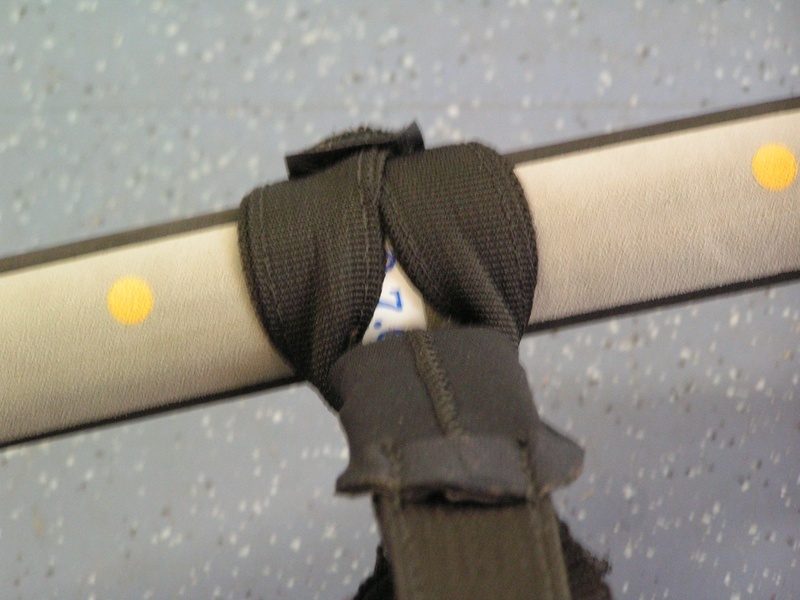 I put the sail in low wind mode, keeping 2 cm under the recommended downhaul setting. For power this was good, but the Vapor Formula board sticked a bit too much on the water. But I had no problem with that. Later on a buddy of mine also came with his Formula gear (F2 + Maui Sails) and we had some TOW together. It was great! 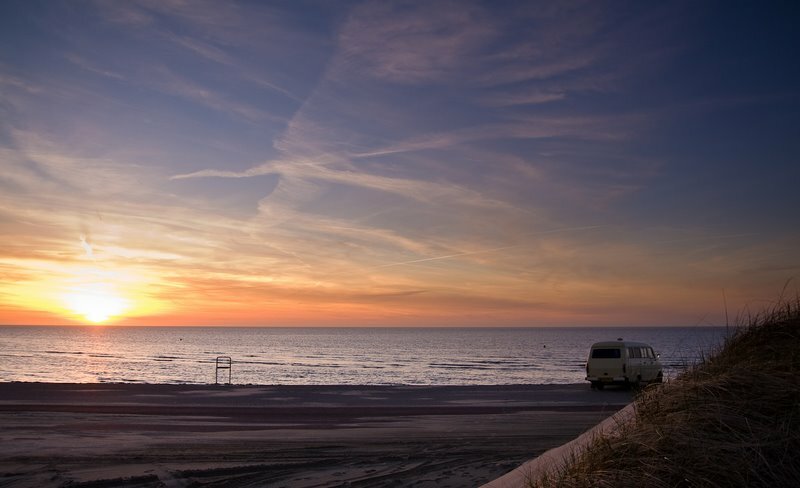 Today (Monday) my weekend starts and I'm going again to the Brouwersdam together with him (Marco Leer) for some TOW. The sun is shining, there is wind predicted for this afternoon and I have some spare time. Life could'nt be better! Everybody who takes pictures sometimes knows it: there are pictures where everything looks allright, and there are pictures you normally would not display ... some puts a finger in his nose, right at the moment the camera says "clicks", or someone just looks stupid at that moment. I had such a moment yesterday. I was underpowered with Vapor 7.6 + Manta79. I felt my back a bit after a difficult day on the water. This picture is taken while going as much upwind as possible while the wind dropped a bit. I look like I am going to kill somebody, or at least shitten my pants! I cannot tell too much about the new Manta boards, put I can give a little bit of info. At the end of 2009, 3 new Manta board will be introduced. These boards will have a slighty different shape then the excisting boards. The 59 will be re-newed, and 2 new boards will be introduced: the Manta 65 and Manta 75. That is it for now. Speed, acceleration and controll will be the key words. The Tabou team is testing a lot, all around the world. I am convinced the new boards will be lethal! Different booms, multiple sails and circumstances that are never the same. How do you tune up your boom? Till this year, I always put notes in a small book that I always have with me. I measured up everything : boom height, extension and so on. This year I try to put as much marks at sails, booms and boards as possible so everything is more "what you see is what you get". 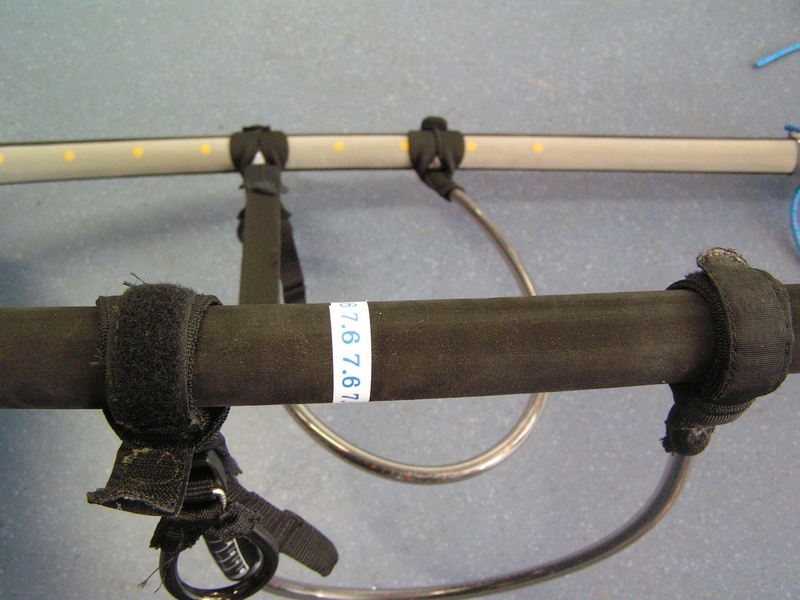 I made some stickers with a sticker machine and wrapped it around the boom, when I slide the harness line over it, at the other side I can see if it is on the right spot. Now, I always have my harness lines correct. For 99%, because when I go speedsurfing it can happen that you do downwind runs on 1 side, and you have to go upwind on the other side. This can influence the position of the line a bit. Last week I had some very good sessions with the Vapor 7.6m2 and 6.7m2. Circumstances were difficult to go fast,but I still managed to get some good runs. I have both the 6.7m2 and 7.6m2 tuned up good right now. I see that back on the GPS right now. Friday was a day with some other guys on the water, so I could see how I was doing. Well, I am doing fine With the bigger set Manta64 + 7.6m2 and 33 fin I was able to get the third fastest average speed of the day. With the Manta54 + 6.7 + 29 fin I have found the low end. This set was a bit too small, but I easily could go almost 70 km/hr with it, and have the second fastest speed of the day. Finally another session. My back is still sensitive for gibing, pumping and waterstarting but planning is going nice. 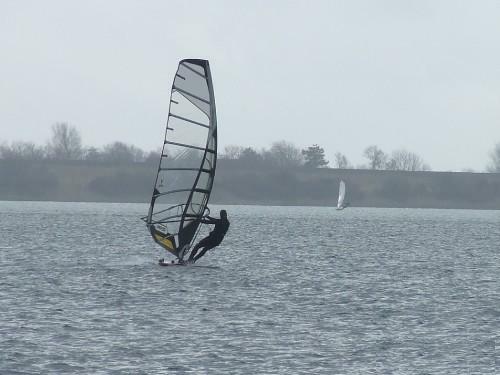 I had a good session with the Tabou Manta54 + Vapor09 6.7m2 and a new fin : Caspar Select GPS Speed 29 cm. What a great fin! 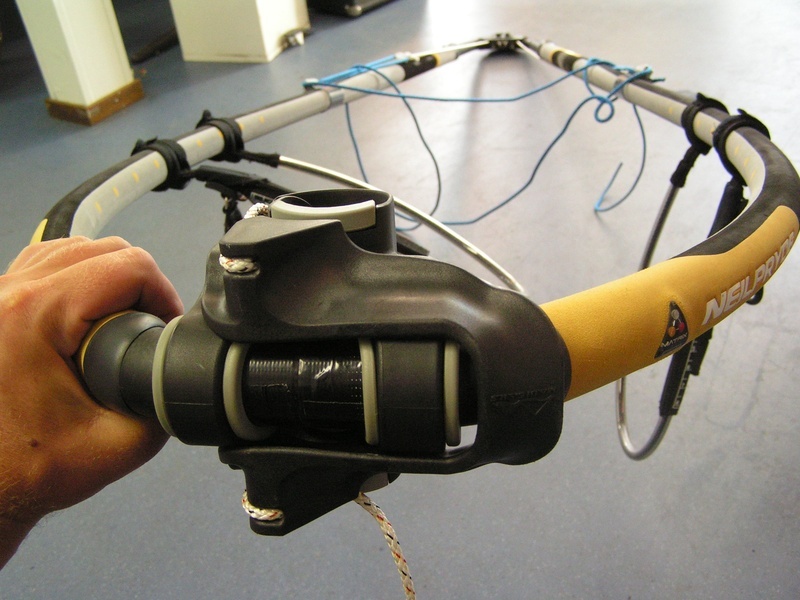 It does'nt only works great on flat water but also in the chop! The speeds were nice, that wind was'nt. It was on and off all the time and a couple of times we had some rain coming down. Today (Sunday) I still have to work 1 shift .. the nightshift. So from tomorrow on (Monday) I have got my weekend. There is some wind coming, but also thunderclouds. Hopefully I can give my back a go tomorrow with the big slalomgear. For Tuesday more wind is predicted. 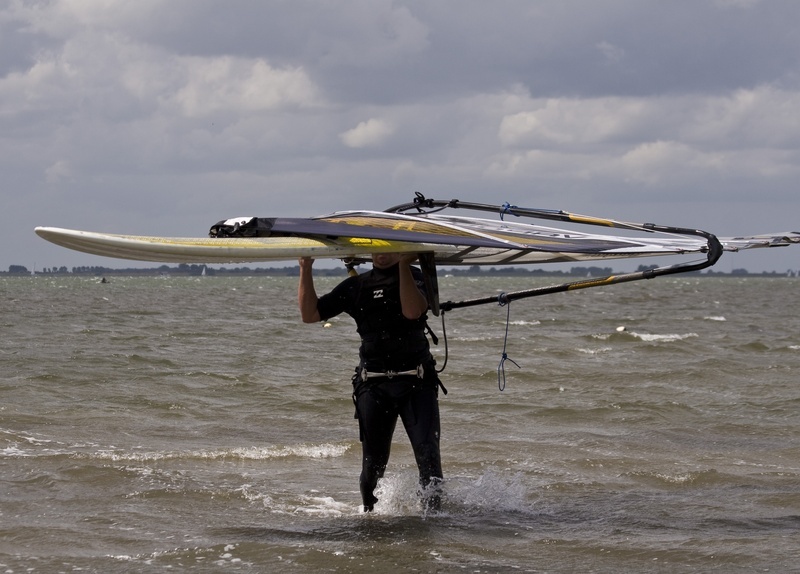 Maybe I am going to Strand Horst for some flat water surfing. I feel lucky I've got weekend during weekdays!!! Each day my back gets more interesting. The colour blue and purple are most common nowadays. I have to take some pills each day especially to make sure I don't get an infection and also a little bit for the pain. Yesterday I was surfing on a new spot with Formula. For some reason I was surfing against the sunlight, missing the fact I came to close to rocks lying just beneath the watersurface. I allready was in a gybe, when I hit the rocks. I got a capapult and land on my back ... on a rock. I directly felt the pain in my back and was screaming. Because of the pain but also because of the fact it happened. 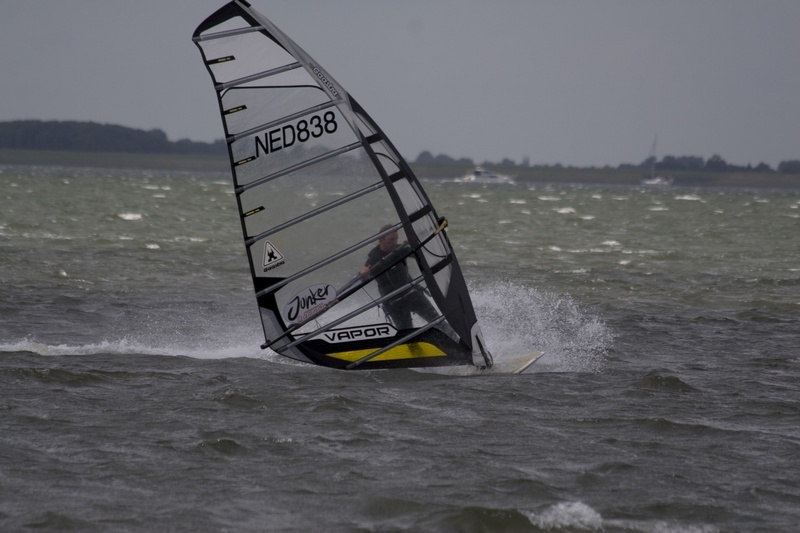 My board damaged, the sail damaged, the fin damaged, the brand new 5.50 Gaastra Gold damaged but most important ... my back! I had to go downwind back to the beach, luckily the fin was still usable to surf in a straight line without any spin outs. Paul helped me getting the gear on the beach. It was his fin, and I was feeling so bad I just ruined it. I unrigged (took some time) and phoned to the doctor. Went to the doctor and directly had to go to the hospital where I had to lay down. So after surfing back, walking and driving to the hospital they wanted me to lay down. X-rays did not showed any damage to the bones. But there is a big ballon on my back now with a haematocele and it is bruised. Pills against the pain, and hopefully it is healing fast. Now I have got the time to work a bit on the website. I still have a lot of pictures I want to put on it from last holidays to Spain and USA. On Ross Williams his site, I found some pictures of testing the proto's. As you can see the luff sleeve is white. Would that be because white is the cheapest colour to make proto' with or has it to do with keeping the mast as cool as possible? The golden layer on the Gaastra race masts allready reduces the temperature in the sun quit a lot and maybe the with stuff helps? 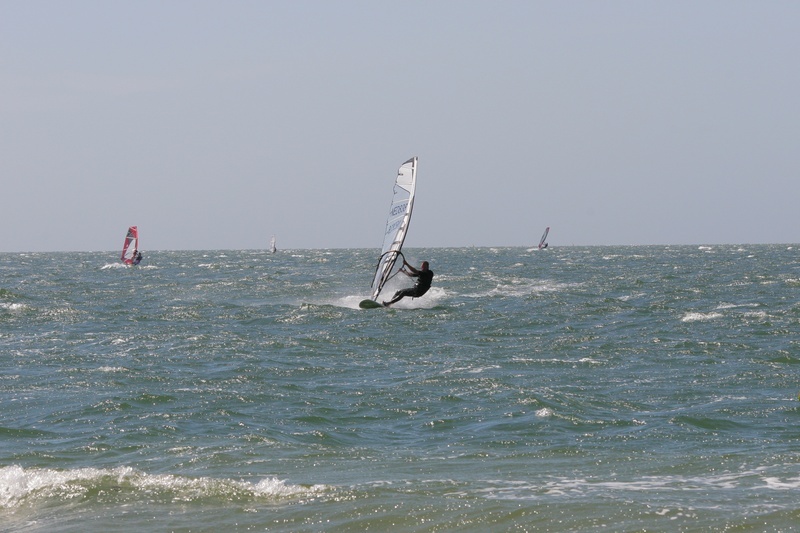 I really need a day off after all that Formula windsurfing in Scheveningen, but there is wind and it is sunny. So I had to go to the water. My whole body is stiff, and my feet don't like to get barefooted in the sand and the footstraps. Last weekend I was in Schreveningen for the NK. Saturday the wind came late. First we went out on the water trying to start a race, but each time the flag came down .... the wind dropped. The wind was gusty all the time and came from 2 different directions. With the sun shining, the beach became warmer but the water is still a lot colder. So the thermic wind came a bit throught at the end off the day. Sunday also was a waiting day with finally some races. Monday in the afternoon the wind picked up and we did 2 back to back races. We had 3 Formula days and it was not easy for me. Now with my first NK, I see that my skills are not good enough. My condition is bad and I need to work on my tactics. My photo-camera is at somebody's else his house so I have to wait some days before I can post the photo's here for you guys. Last Sunday (May 17th) I had my first region cup. We had 2 FW heats, and 4 slalom. With Formula I was on the water with the 12.0m2 Vapor, hands full because during the second heat the gusts were almost 20 knots on the water. With slalom I first rigged the 7.6m2, but it was to small. I could borrow somebody's boom so I could rigg the brand new 8.4m2. In combination with the Manta79 and a 47 fin I had a nice race. I ended up at 9th place, and with a lot of experience and "things to do". Normally during my sessions on the water I look at the max speeds. I found out during this cup, that everybody is fast. So I have to work on my gybes, pumping and so on. Last 2 days I began with that. Also I am not used to make a lot of gybes: normally during speedsurfing I try to make good speeds, have a short break .... make runs again .. but with slalom it is gybing, racing, gybing, racing, gybing etc. So I have something to do! Next weekend hopefully the Dutch Championshop @ Scheveningen. My first one ever! Next tuesday our holiday starts. Monday afternoon we will drive to our friends who live nearby Rotterdam where we gonna spend the night. The next day we will take the train to Belgium (Brussels) where we take the plane to Chicago. In Chicago we have a transfer to a continental flight which will bring us to LA. 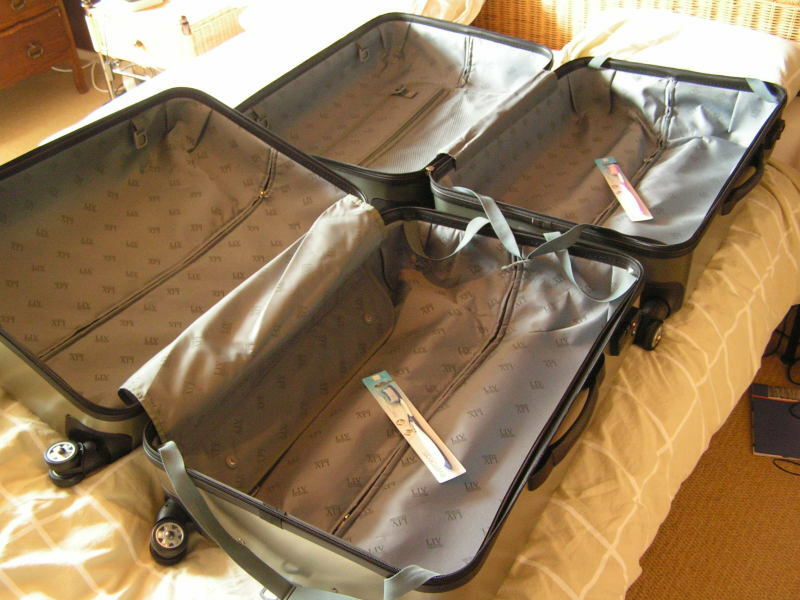 I took care off the visum and other things including buying new suitcases. We have to recognize them so I out some stickers on them (left). 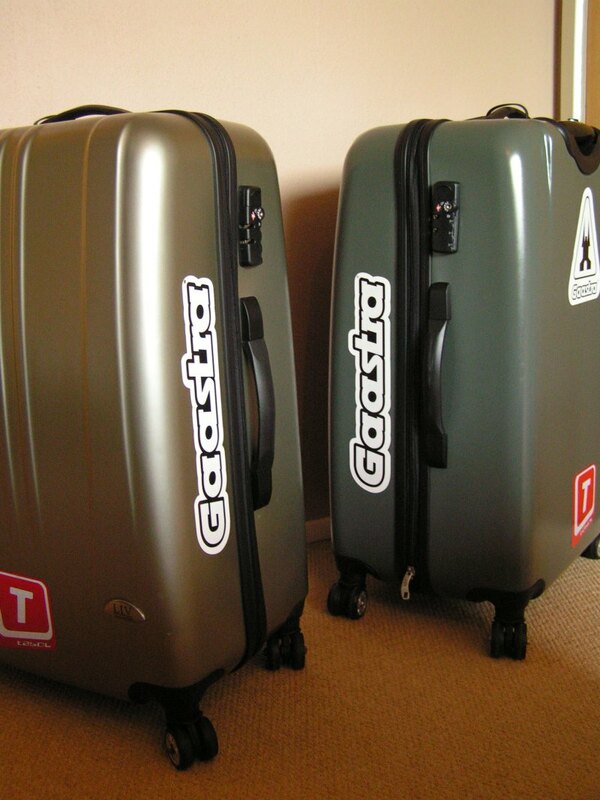 I allready put the most important items in the cases (right) . 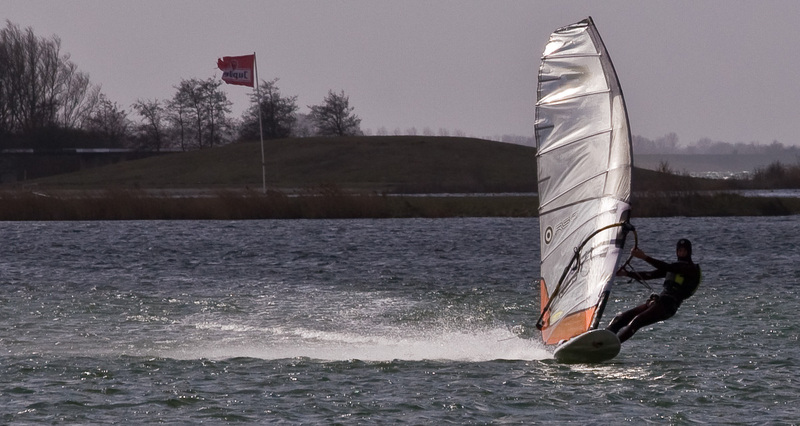 Hopefully next Sunday there will be a "regiocup" on lake Veerse Meer, otherwise I will be back on the water next month with a sail in my hands. Hopefully in California we can do some surfing with a longboard. Finally I got mine Vapor Racing board! Yesterday had the second session with it and it was fun! Wind should be about 13 knots yesterday so I rigged the 12.0m2 Vapor. 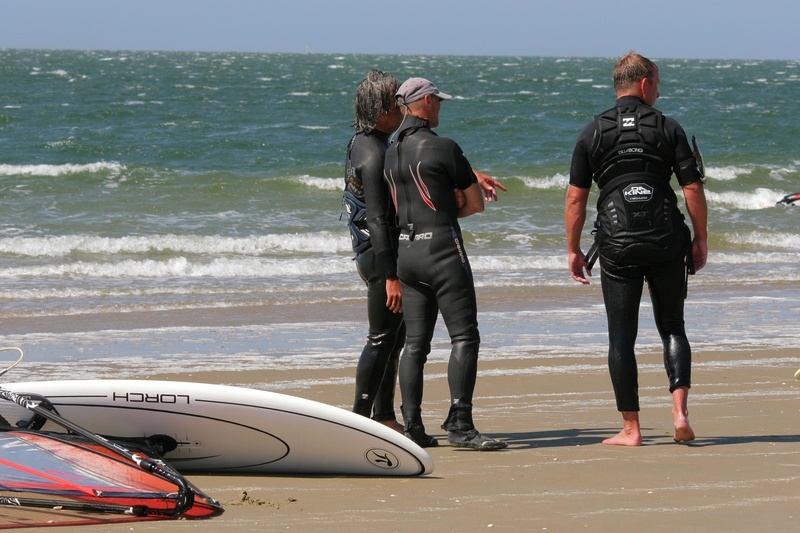 I surfed together with a surfbuddy, also with the 12.0m2 Vapor. We did a long distance, crossing the lake. Wind was between 0 and 15 knots. 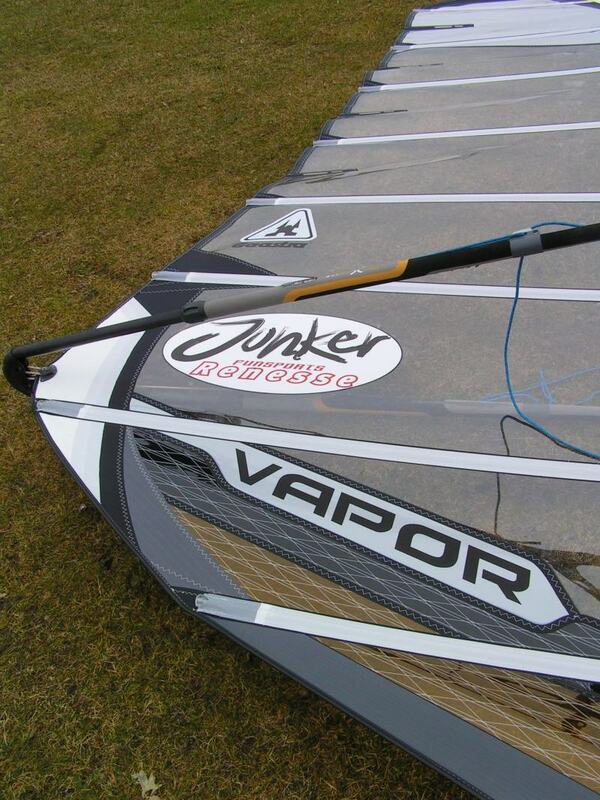 The Hurricane FRB8 S- fin does a great job under the Vapor board! Power at all times, and still controlable with the increasing wind. The Vapor board is a very easy board. It is 17cm shorter comparised with my previous board and has a wider tail. The board needs a powerfull fin, which the FRB8 is. This week I see some FW winds coming up. Keep you posted!!! Finally could make some TOW again last week. I have sailed with 2 new sizes 5.5m2 and 6.7m2 and I had time to finetune them both. Also did some low wind with the 7.6m2. I have to analyze the last session, but wind was minimum and I had one gust. Tuesday I had a break, the night shift last weekend teared me apart. That day would have be a very good day at spot Grevelingendam, Paul was flying. But I stayed dry and I made some pics. Funny, 1 week you are standing with 11 metres in your hand, another week with 5.5m2. Sunday I had a very nice session withthe Manta79 + 7.6m2 + 43cm fin. This combination is really working very well. It just feels logical. Sunday the wind was about 12-15 knots, so I could test somewhat more the low end off this set. And it's good! The 7.6m2 gives a lot off power and a nice pull. In the chop the Manta79 gives 100% controll. A day later I made the 5.5m2 wet for the first time. I rigged it with almost 1 cm less downhaul then recommended, put a 27cm fin under the Manta54 and went on the water. The wind was square all the time. I made a run, and thought "it does'nt goes fast at all, it just don't feels fast". I watched my GPS screen and saw a 70 km/hr. Uh? I asked around what other had, and 70 km/hr seemed to be pretty fast looking at the circumstances. The speeds increased that day and at the end the wind shifted a bit to perfect angle and I was able to make 1 descent run. In that run I set a new PB on the 500 metres and made my best 10 seconds run off the day. Now I have 2 perfect matches: Manta79 + 7.6 and the Manta54 + 5.5. Especially the last one is working perfect! The 5.5m2 gives a lot off power as well as the 7.6 in the bottom. The center off effort is more to the back then my previous sails, and the sail has got a nice leech. So power in one hand, controll in the other. This is going to be a very good year! Today, the wind was around 20 knots, the water was choppy (max about 1 meter) and the temperature was going up a little since a long time, to a nice 9 degrees celsius. 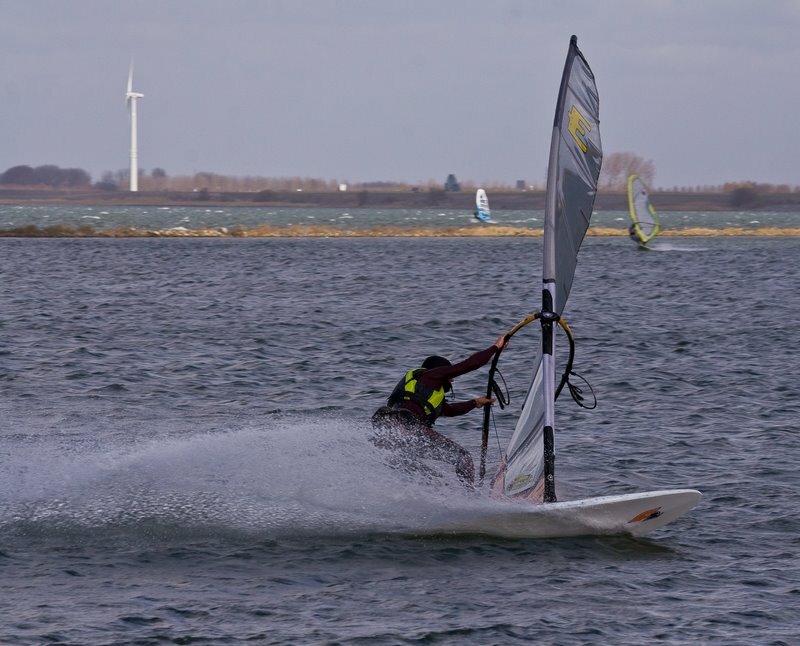 Went on the water togehter with a surfbuddy (Jeroen Schuitema) to do some nice long distance slalom. And long distance it was. I am not used to surfing anymore since this was the third session since a long time. And the first longer session. I stopped at 136 km. The day after I am feeling all kind off muscles and bones I have not felt for a while . The 7.6m2 Vapor2009 is a really good sail. It is stable, powerfull, handles very good in the gusts and the feeling is neutral with some backhand pressure. The sail reacts very good on tuning with the outhaul on the water, just what I was looking for in a racesail! I have set the base at 22cm and that was perfect. The combination with the Manta79 and the 43cm is briljant. 08-03-09 The new season officialy started for me. 08-03 I had the first session with the Vapor09 7.6m2. After some adjusments the sail was performing very good. It was stabil, powerfull with a nice pull. Also the controll in the chop was good. It was a pretty good test for the high end. 09-03 I could test the Vapor09 6.7m2. This sail needs some more tuning. It felt somewhat a bit heavy and "stiff". Probably I have to add an extra cm downhaul (1 cm above setting) to give it a more open leech and more controll with less back hand pull. But that both sails have a lot off power .. that's for sure! Still have to wait a month for the board, but the fin has arrived. It is the Hurricane FRB8 S- (70.1), 4 degrees rake. The fin has a nice thin profile, and is soft in the tip. The finish is very good, looking at mine Select fins. It has quit some surface, and the tip flexes nice. Hopefully this fin is going to bring me what I was looking for: power for lowwind, no twist, and a flex that keeps me foiling and giving me the controll with increasing winds. Today I went to my shop http://www.jonkerfunsports.nl/ to get the new Gaastra Vapor 2009. I got the 5.5m2, 6.0m2, 6.7m2, 7.6m2 and 11.0m2. I am keeping the 12.0m2 2008, and maybe I'm gonna order the 8.4m2 as well. I could test the 11.0m2 a bit today. My FW board is coming next month, but I could borrow a Fanatic Falcon TT06 so I could get a go. The first touch down felt pretty good! 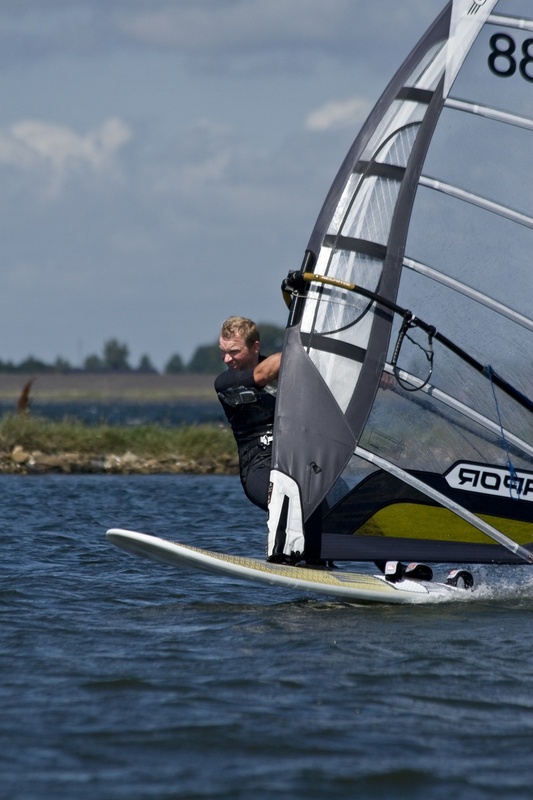 I will need some time to get used to the Gaastra"s but I could allready feel the power in the sail and the stability. I have made a race calender for myself. 2009 is gonna be the first year for me that I will do some racing. Last year I have worked a lot and made a lot off hours. So now I have got time to spend for some racing. All races are during the weekend ... and I work a lot off weekends. My first real Formula board I ever had is sold. I had it for 3 years + 3 days : The F2 FX100III. Before that I had a Starboard Freeformula 158 Wood, and now ... now I have to wait for the Gaastra Vapor board. 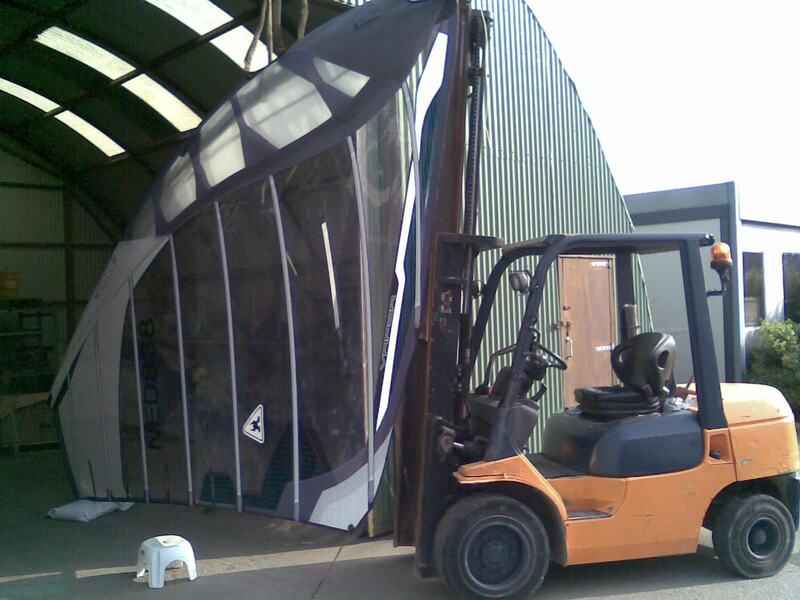 Also all the sails (only the 11.9m2 is left) are sold. Since December I have not surfed at all! And the strange thing is: I really am not thinking about surfing. I just cannot go because off no-equipment. So I'm doing other stuff: started running again, painting inside the house. Doing some maintenance on the gear I still have (cleaning the boards .... regripping the X9 booms and that kind off stuff). Temperatures are still low down here. 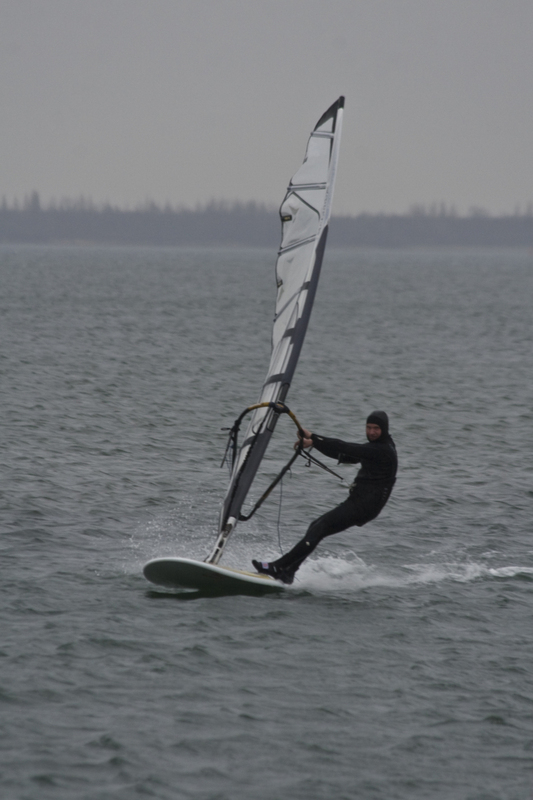 This is my first real winter while I am a windsurfer. "A windsurfer", that sounds a bit strange ... 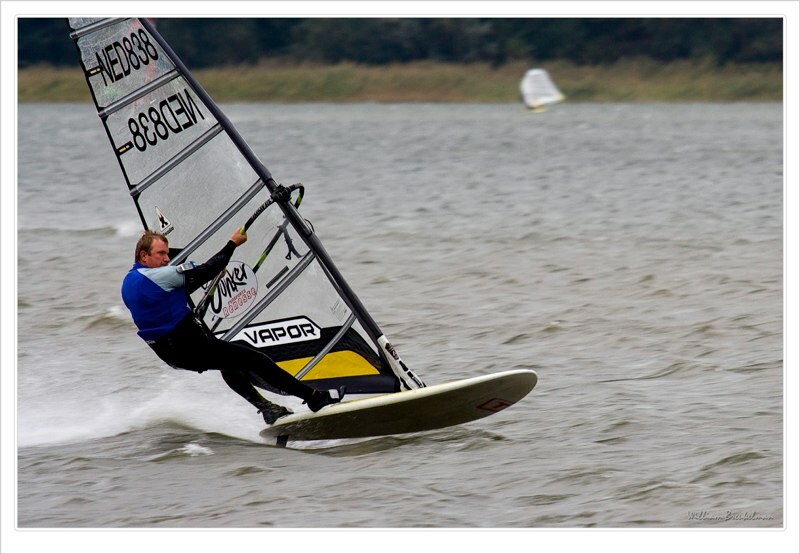 I have a hobby, and that's windsurfing. 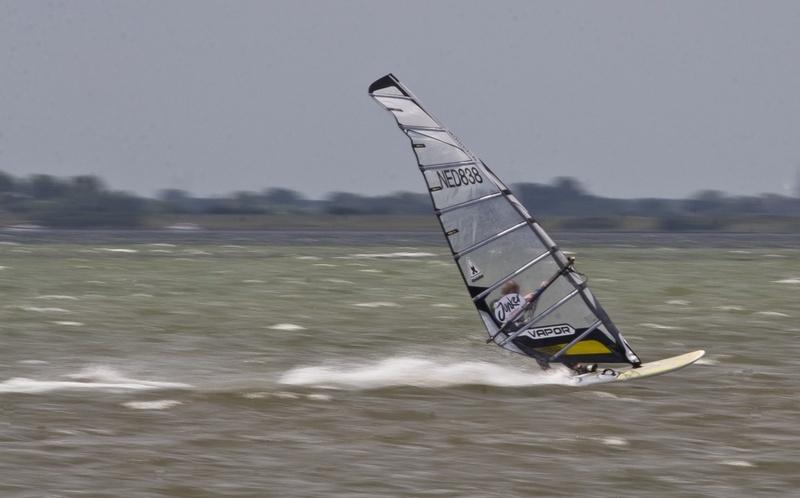 But windsurfing is also a feeling, a way of life. 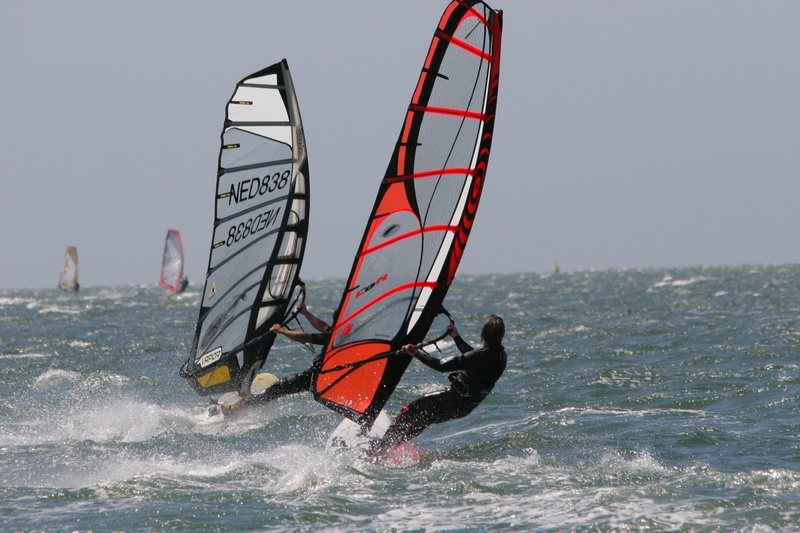 The music you listing, the holidays you plan around the sport ... yes, I am a windsurfer! Notice it can take a while before the video is loaded. After e-mailing with Sean O Brien and Otmar from Hurricane Fins, I made up my mind. I just ordered a new low wind monster, the new FRB8. 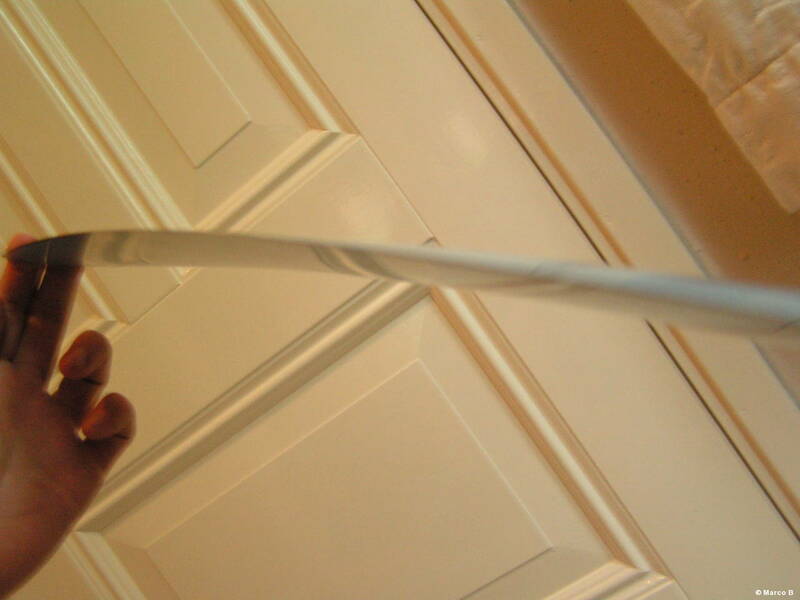 Supersoft, with a lot off flex and just a little bit off twist. It is not on the Hurricane website so I will write here my impressions when I've made the first sessions. There is not a lot off info on the web about the Vapor board + fins, so I hope I can make a little difference. I'm a bit late but the last couple off weeks I started to read a lot about FW fins, and make up my mind for new fins for this year's board: the Vapor board. The R16 I have does not fit this board and the conditions where it supposed to do it's job: 8-14 knots. So what would be the perfect fin? If I would have the money it would be the Kashy XXS. 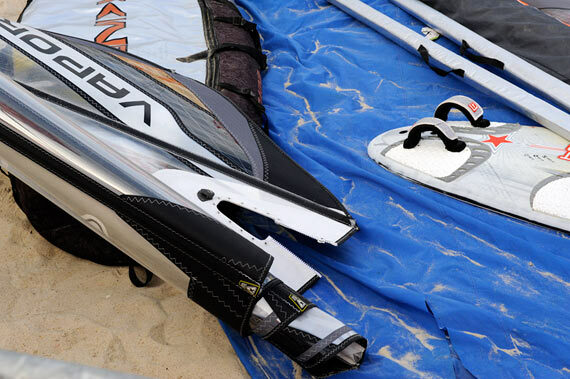 In combination with the 12.0 Vapor, the 85 cut down to 70cm would be the best fin for low wind Formula surfing. But l allready mentioned: I do not have Kashy money. So the search continued. Also Deboichet was not the best option for me. Deb makes great fins, but for guys like me it is very difficult to get customized Deboichets. The "standard" custom fins work good in particular circumstances, with a curtain wind and rider ... while I am looking for 1 or 2 fins for a max wind range. The best option for me was Hurricane. Hopefully I have my fins as soon as possible. I actually have to order them still but I'm waiting for some feedback from Hurricane. My choice at this moment will be to have a fin approx 76 cut down to 70, and a normal 70. Stiffness and flex are still some issues, but I pretty made up my mind. Fins are really interesting. Stiffness, rake, sizes, conditions, sails. Everything is important. It is still 3 months ahead, but we begun to organize the next holiday. With 2 friends we are going to the USA (westcoast). We start in LA and end up in San Fransisco. The year 2008 is gone. A year with not much to surf for me. Normally I can get some extra TOW in the summertime, when we are on holiday in Spain. In 2008 we decided not to go to Spain but to France, without the windsurfgear. Also I had some extra work that needed attention. 2009 is, again, going to be a year without a windsurfholiday but also without a trip like Gruissan. In April we go to the USA, without the windsurfgear. Also the work is going to cost me some TOW. But there are also nice things: Februari/March my new Gaastra Vapor sails will arrive. Also I'm gonna get a new FW board: VAPOR. So, I'm looking forward to give the new stuff a go and to have good quality time on the water. On the internet the first information about Select Fins 2009 can be found. As a Select user (with good experience) I am looking forward to inside information about these fins. While I am not really a " die hard speedsurfer" but just one off those who just want to have a great time on the water regardless chop, max speeds and so on, the Select fins are just good enough for me. But that Dutchie Caspar Verhaagen (very known Fin builder) gives his name to a fin, well than it has to be just great. So I am looking forward to information about it (included the prizes).